We are an IB World School offering the IB Diploma Programme for Grades 11 and 12. This is preceded by the IGCSE (International General Certificate of Secondary Education) syllabus from the University of Cambridge for Grades 9 and 10. For the Middle School we have begun work towards gaining authorisation for the IB Middle Years Programme, while for the Elementary School and Early Learning Centre, we are one of only two schools in Korea that have achieved authorisation to offer the IB Primary Years Programme. By setting ourselves the goal of providing the best level of international education, we are providing a quality education with quality facilities. It is a broad curriculum that allows students to move easily around the world and to complete their studies at top quality universities around the world. BIFS is sited on a brand new campus with excellent sporting, technology, art, music and other facilities. It has a broad after school electives programme and works hard to give the students as many opportunities as possible. 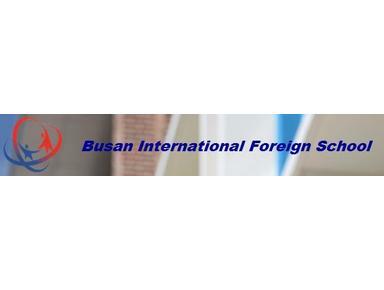 The Busan International Foreign School is a not-for-profit school being run by a volunteer Board of Governors made up of qualified parents and members of the community. We are very pleased to be able to work alongside a team of dedicated and experienced people who have the welfare of the children as their one goal.